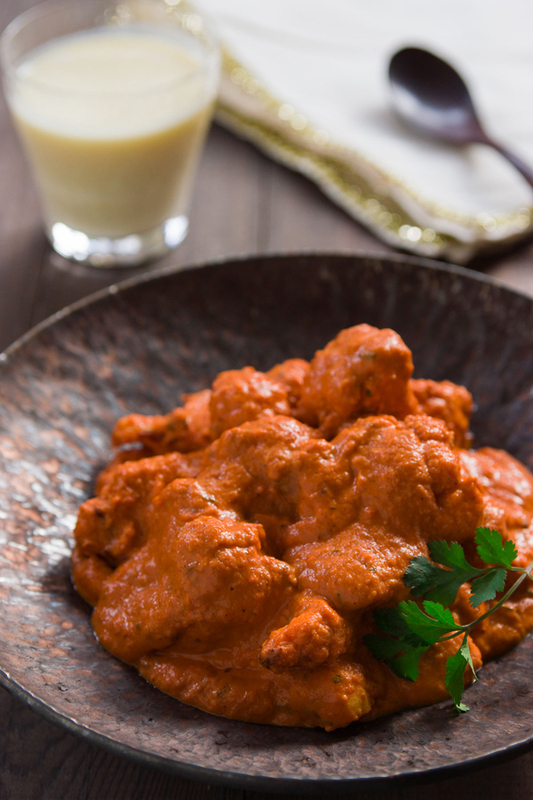 Butter Chicken is a global favorite within the pantheon of Indian classics, but this vegan take includes no butter, no cream and no chicken. 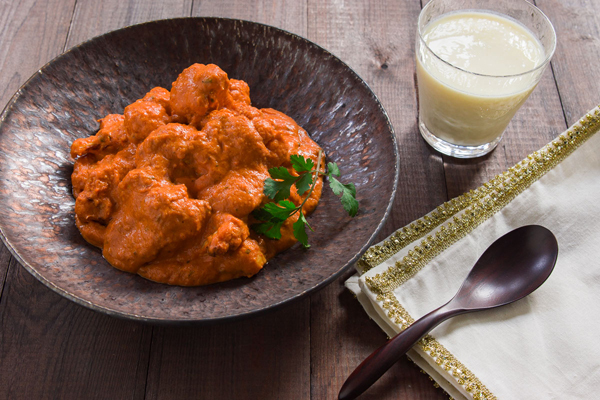 I know some of you are probably frowning at the screen right now upset that I’ve called a dish with no butter or chicken in it “butter chicken”, but this dish is so close to the original, it just seemed wrong to call it a tomato and cauliflower curry. In place of the chicken, I’ve used big hunks of cauliflower marinated in aromatics and spices that are roasted until caramelized. In place of the butter and cream I’ve used a combination of raw cashew nuts, coconut oil and nutritional yeast. I’d be lying if I told you that cauliflower has a taste and texture exactly like chicken (because it doesn’t), but is it meaty and delicious? Absolutely! It’s the sauce though that really makes this dish shine. Rich, creamy, and redolent of warm spices, this curry strikes a marvelous balance between sweet, savory, spicy and tangy with loads of umami to boot. 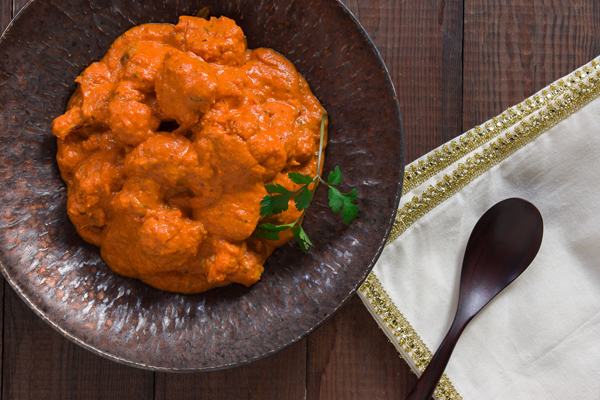 I modeled it after my real butter chicken, caramelizing the tomatoes as well as the aromatics, which lends depth and sweetness to the sauce. The cashews and coconut oil add plenty of richness to the sauce, and what they lack in dairy flavor is more than compensated for with a generous helping of nutritional yeast. 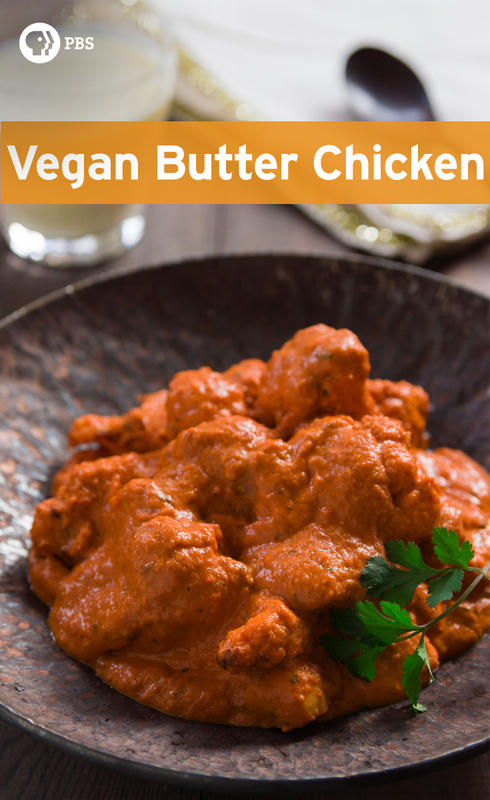 So there you have it, my faux “butter chicken”, which ranks right up there with my vegan tunafish sandwich and Southwestern Tofu Scramble among dishes that even the most stalwart carnivore can enjoy. Peel and grate the ginger and garlic together. 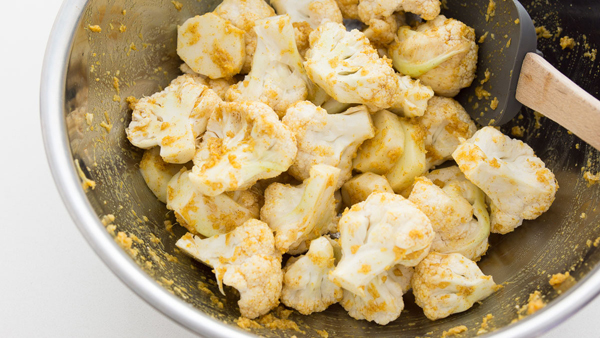 Wash the cauliflower and separate the florets into 2-inch chunks. 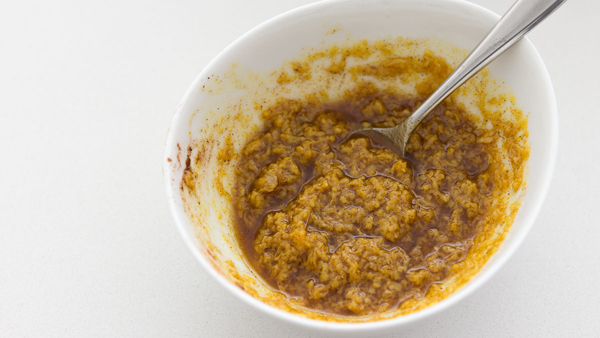 In a small bowl, stir together 1 tablespoon of vegetable oil, 1/2 tablespoon of lemon juice, 1/2 teaspoon of salt, 1 teaspoon of garam masala and 1/2 of the garlic ginger mixture. Pour this over the cauliflower and toss well to coat evenly. 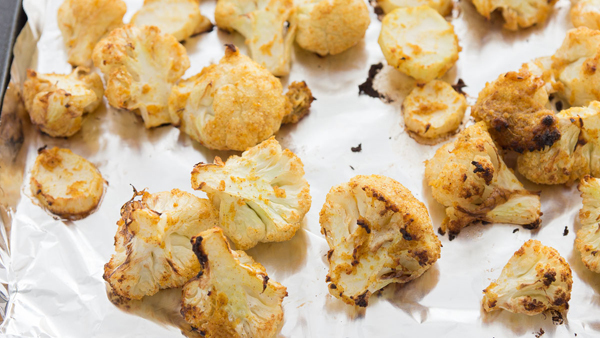 Spread the cauliflower out onto a baking sheet and then roast in the oven until tender and golden brown (about 20-25 minutes). 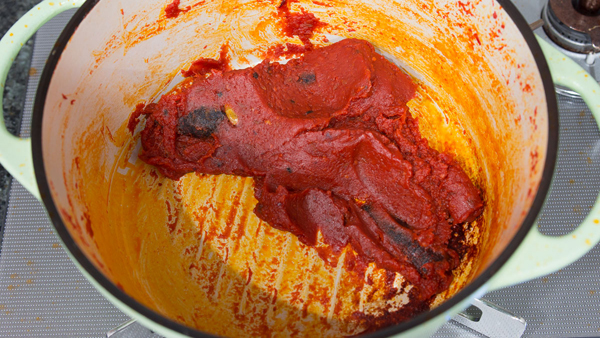 Meanwhile, put the canned tomatoes in a blender and puree. 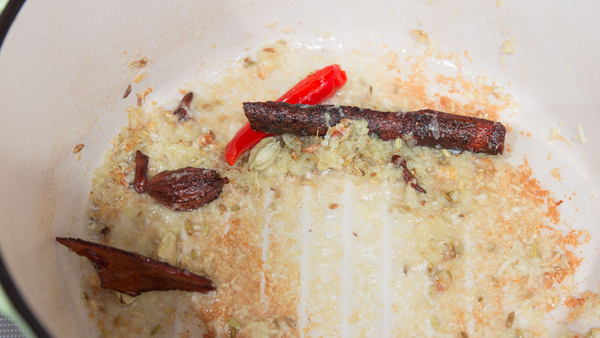 In a heavy bottomed pot, add the coconut oil, green and black cardamom, cinnamon stick, fennel seeds, cloves and chili peppers. Fry the spices until fragrant (1-2 minutes). Add the remaining garlic and ginger mixture to the pot and fry until the garlic starts to brown and the mixture is very fragrant (2-3 minutes). Add the pureed tomatoes and simmer over low heat until the tomatoes are thick and paste like (about 45 minutes). Once the mixture starts sputtering, you'll want to stir it constantly to speed up evaporation and to control the sputtering. In the blender, puree the cashew nuts and nutritional yeast with 2 1/4 cups of water until smooth. 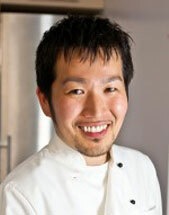 When the tomatoes are done caramelizing, add the mixture to the pot and stir to combine. Add the roasted cauliflower, fenugreek leaves, and 1/2 teaspoon of garam masala to the pot. Season with salt to to taste and simmer together until the flavors meld together (about 10 minutes).